Several years ago I wrote about creating a WiFi extender for our previous boat, the MV LAIKA. 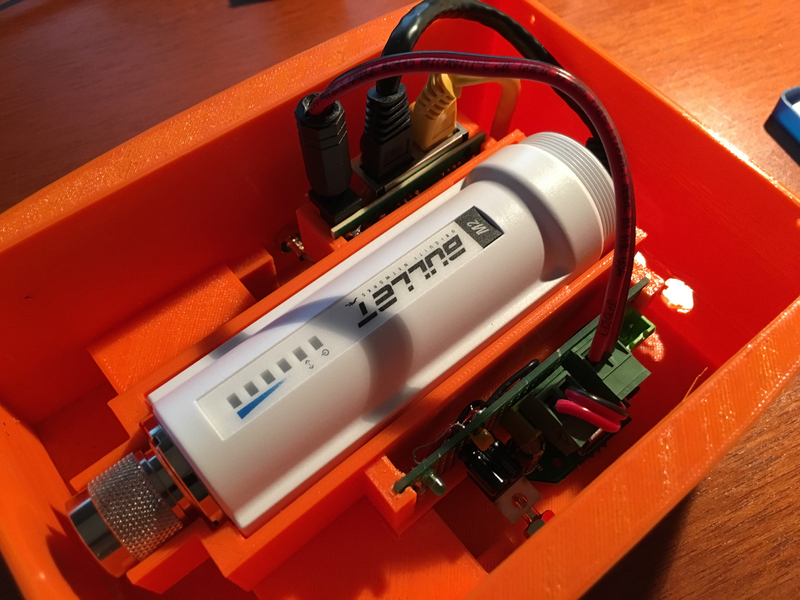 For that project, which you can review here, I utilized a Ubiquiti Bullet high-powered WiFi radio to bring distant marina WiFi signals into our boat where they were re-broadcast through a private network. Things worked fairly well back then. In fact, I had even permanently mounted the antenna for the Ubiquiti radio on top of the boat so it could benefit from the added height and increased signal range. When that boat was sold the antenna and custom wired setup went with it. Fast forward several years, and with a new boat, I decided to revisit the same challenge after repeatedly visiting marines only to discover that it was often difficult picking up WiFi signals when situated in distant slips. The problem was most apparent, and most frustrating, when we stayed in Vancouver at Coal Harbor Marina – a premium marina in the heart of downtown Vancouver, B.C. Despite having a first-class facility they’ve neglected to wire the marina with WiFi and force guests to walk over to their front office in order to gain online access. That’s neither convenient nor fun late at night or when it’s raining (or snowing!). So the extended WiFi project was reborn. Interestingly, and perhaps a testament to the success of Ubiquiti’s products, the Bullet WiFi radio is still a leading choice for building consumer-grade long-distance WiFi networks. So, again, it was selected. Those were all the items that went into creating the latest WiFi extender. The purpose of the Ubiquiti Bullet, along with the Engenius antenna, is to communicate with distant WiFi access points. They could be a mile or more away and it might still be possible to effectively communicate with them. The TP-Link Access Point is what communicates with the Ubiquiti Bullet and creates another, private WiFi network inside the boat. If you were just driving a single PC you could connect directly to the Ubiquiti, using a CAT5 cable and POE source, but in our experience there are often several people and multiple devices that need access to the Internet simultaneously. The first time I did a project like this I had separate components and multiple power supplies (at that time I was using an AC-powered POE injector). This time I decided to create a more pleasing and easier-to-manage package. That’s why I, basically, re-installed the guts of this thing inside of a component case I found at Fry’s. The TP-Link router came in a beautiful, curvy plastic case but after removing two screws it was revealed to be a tiny little board with little more than two antenna connectors. That’s what made inserting it into my own case so easy. This project is also different from the first time I built something similar in that I decided that the whole unit would be self-contained – including the antenna. While mounting the extender’s antenna externally, on my vessel’s arch, would provide for greater signal reach (like I did before) I decided that I’d be able to get by with something that could reside inside the cabin. My thinking was that I could pull the device out of a closet and stick on a shelf while we were in port connected to shore power (or near shore on generator) and then hide it away when not in use. I could also position it in different places in the boat, if necessary – or move it to a friend’s boat just as easily. Currently I’m driving the device with a 9V AC-to-DC adaptor but could easily rig it to run off the boat’s 12V system. By forgoing an externally mounted antenna I also reduced mounting and wiring complexity and cost. If you’d to build something similar for your boat feel free to reach out for additional details about configuring the two main components. Additionally, if you’d like me to create one for you, I’m happy to do so for the cost of the components and a coffee! I’m starting to explore the use of 3D printers and I figured I could create an even better case for the next one I assemble. Of all of these systems, the most integrated ones appear to be The Wirie and Global Marine’s Redport. They’re also similarly priced. Still, you could do it yourself for about $100 less. The other alternative, of course, is to use your cell phone’s data services. Things have changed quite a bit from when I first built my range extender for the MV LAIKA. For example, when I’m at Carillon Point, my AT&T LTE service delivers speeds in excess of 30Mb/s down and 12Mb/s up! That’s remarkable, and far, far faster than the BBX WiFi the marina provides. But, it’s a trade-off. With your own WiFi network bridging a marina system you can drive more devices without, potentially, jeopardizing your data plan’s capacity limits. I’ve discovered 3D Printing! Waited a few years – and I guess that’s a good thing. The current set of tools that are available are quite remarkable, and more refined than those that were available a few years ago. For example, I designed a new case for this project using TinkerCad – a free, browser-based application from Autocad. It’s super easy to learn and use. 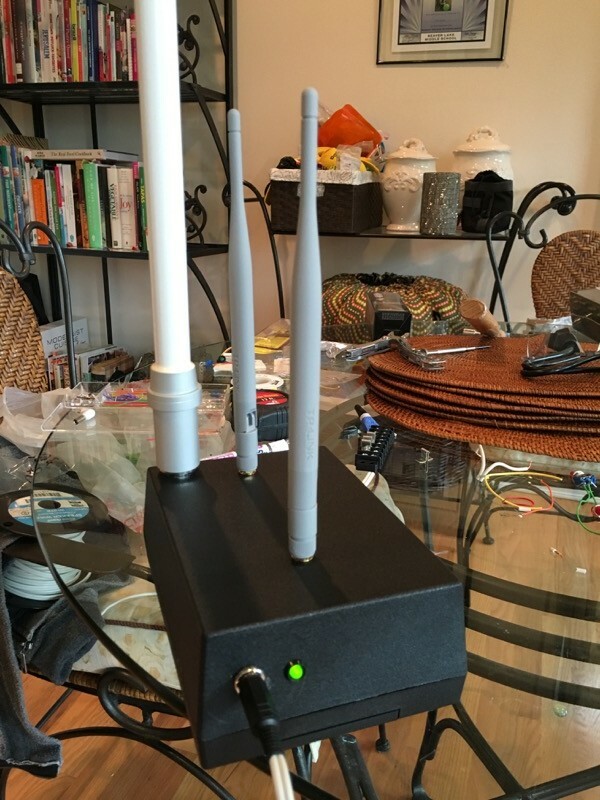 After about a week I was able to construct a brand new case to hold the TP-Link router, the Ubiquiti Bullet, a POE adapter and a 12-to-9V power regulator I designed and soldered to a tiny PCB. With TinkerCad I was able to print using a network of hobbyist-owned printers, finding one in Redmond, not far from where I live. Version 1.0 of the case turned out extremely well and I’m looking to make a few refinements for the next one. I also found an online tool that could take any 2D drawing and convert it into a 3D .stl file which could be imported into TinkerCad. If you want to see some of the objects I made with TinkerCad just search their gallery for my user name – davidgeller. When this project is completed I’ll likely release the full set of components so you can create your own case. I haven’t had this much fun since…well… Boating! This entry was posted in Electronics, Uncategorized by David. Bookmark the permalink. Have you tested signal strength with the box (antenna) inside vs outside? How much loss do you get by opting to keep the antenna as part of the whole? I suppose you could switch out a coax connector to give you the option of moving the antenna further away? Thanks! I have not tested signal strength with the smaller WiFi antennas on the inside. I don’t have any specific test equipment but may try to do some casual real-world tests with that configuration. I’m guessing it would probably work just as well considering how small an area it has to cover for the average recreational boat. I’m currently designing a new case in CAD and will 3D print it when done. Great write up! I’ve built several of my own as well, after having had the Wirie as a commercial product. While their product is great, being a network engineer, and wanting access to extra features, it was disappointing that some of the default bits of their solution are masked by their custom firmware. I prefer the Ubiquiti Bullet as you used, which has a fantastic feature set. I use a Pepwave WiFi AP which the Bullet is connected to for WiFi, but also has it’s own set of features around LTE and drives those speeds up very high. It’s starting to get to the point, as you mentioned, that LTE speeds are surpassing WiFi, as long as you have enough in your data plan to cover it! Thanks Steve! I had fun with it – and having even more fun with v2. Creating the custom case has been a blast. Also creating my own 9V regulators so that I can take in 12V and drive clean 9V to the TP-Link router. 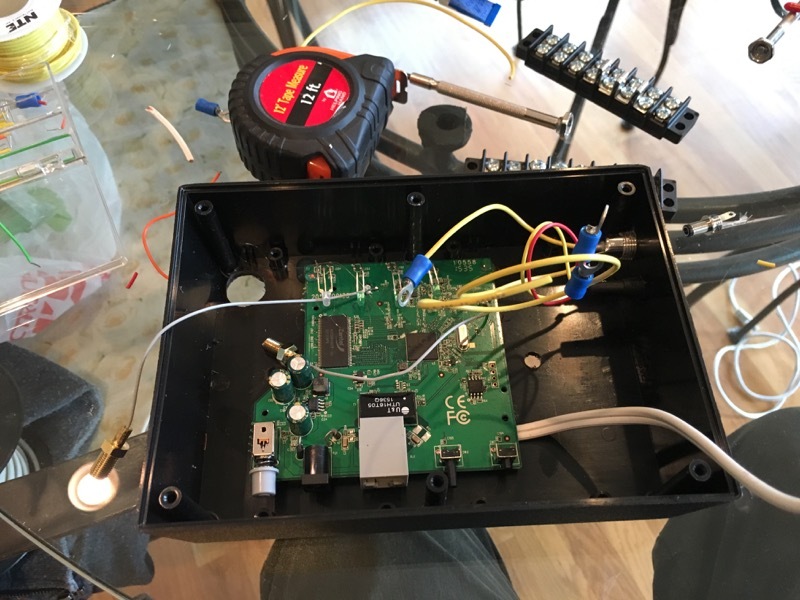 It can probably take 12, but it’s rated to take 9V… Plus, it gave me a chance to tinker more. The Pepwave stuff looks interesting, but I think it would be hard to beat the $23 price of the TP-Link. Oh for sure, the TP-Link is one of the best AP’s on the market because of its power, and you can’t beat the price. I like the Pepwave because of it’s ability to auto change sources for Internet (WiFi or LTE) and because I have it meshed together with two other locations via a VPN, which makes accessing things on the boat from home or elsewhere very convenient.